What You Should Know Before Buying an Affordable Laser Marking Machine? What is Laser Marking Machine? Laser marking machine is a type of laser system with CNC (Computer Numerical Control) which adopts fiber, CO2 or UV laser beam to leave permanent marks of letters, numbers, signs, logos, patterns, pictures on an 2D/3D surface such as metals (stainless steel, carbon steel, galvanized steel, alloy, copper, brass, aluminum, gold, silver, iron, titanium), wood, leather, fabric, plastic, glass which also includes color change due to chemical or molecular alteration, charring, foaming, melting, ablation, etc. This is different from ordinary inkjet printing and CO2 laser engraver. Laser marking machine has advantages of high speed, high quality, high precision, pollution-free, safety, easy operation, free maintenance and low cost. Laser marking machine is also called as laser marker, laser marker machine, laser mark machine, laser marking system, laser marking equipment, laser printing machine. Laser marking machine has 6 different laser marking processes include annealing marking, staining, laser engraving, removing, foaming and carbonizing, which is widely used in industrial manufacturing applications, school education, small businesses, home business, small shop and home shop. There are three types of laser marking machine include fiber laser marking machine, CO2 laser marking machine and UV laser marking machine. As you are looking for, we always call them as laser metal marking machine, laser wood marking machine, laser jewelry marking machine, laser gold marking machine, laser stainless steel marking machine, laser bearing marking machine, laser plastic marking machine, laser glass marking machine. Laser marking machine are divided into small/mini laser marking machine, portable laser marking machine, handheld laser marking machine, tabletop/desktop laser marking machine according to table sizes. Laser marking machine are divided into home laser marking machine, hobby laser marking machine, industrial laser marking machine according to machine applications. Laser marking machine are divided into MOPA laser marking machine, UV laser marking machine, color laser marking machine, 3D laser marking machine, online flying laser marking machine according to functions. 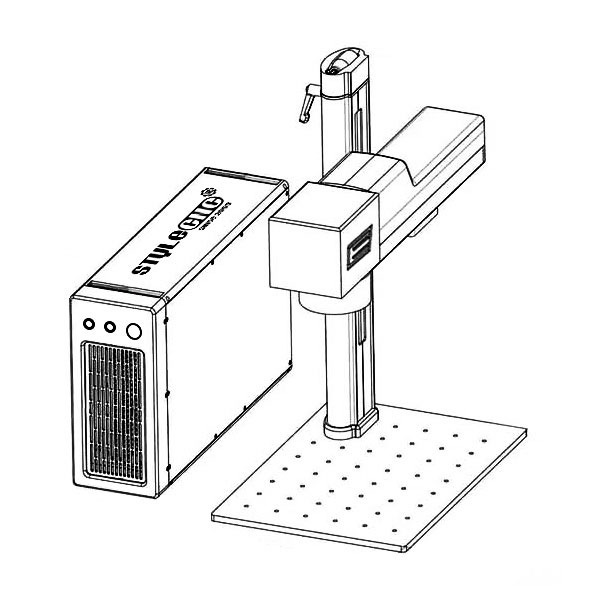 As a guaranteed laser marking machine manufacturer and supplier, STYLECNC provides all kinds of best laser marker for sale to fit your works. STYLECNC laser marking machines adopt genuine laser marking software and laser marking system, the best original laser marker parts and kits. STYLECNC offers ex-factory price for your laser marking plans without any intermediate. You will get the best laser markers with the affordable price from us. STYLECNC also offers smart 2D/3D laser marking solutions, 24/7 one-to-one laser marking machine service and support, which is available free. We will recommend the most suitable laser marking equipment to you after being informed by your requirements. We will offer you with our detail quotation according to the consulted laser marking equipment. You will get the most suitable laser marker specifications, the best laser marker accessories and the affordable laser marker price. We will arrange the laser marking equipment production as soon as receiving your signed sales contract and deposit. The latest news about production will be updated and informed to the laser marking machine buyer during the production. The whole production procedure will be under regular inspection and strict quality control. The complete laser marking system will be tested to make sure they can work very well before out of factory. We will arrange the delivery as the terms in the contract after the confirmation by the laser marker buyer. We will supply and deliver all the necessary shipping documents to the laser marker buyer and ensure a smooth customs clearance. We will offer professional technical support and intime laser marking system service by Phone, Email, Skype, WhatsApp, Online Live Chat, Remote Service. We also have door-to-door service in some areas. The gun laser engraver is awesome for handguns deep engraving, the laser engraved patterns are very beautiful, I like it. This is Melanie from USA, I am really happy to get a good machine from STYLECNC. The unit arrived undamaged and in working order. This is huge. The overall quality of the flying laser marking machine was as expected or slightly better. They have given me great customer service. We bought the STYLECNC 3d crystal laser engraving machine for inner marking crystal and glass, very good effect, highly recommended. UV laser engraving machine is exactly what I need! It is a really convenient machine for the wine bottle. This is a fantastic machine for engraving notebook keyboards. No additional costs and saves a lot my time. We ordered this laser engraving machine from STYLECNC to engrave parts for our company. The seller provided me with tracking info for the shipment when requested. I received the laser machine two days early, very Impressed with the quality, very well built. I have not used one before I contacted the seller for help and was up and running. Beautiful engraving and easy to use. I can't beat the price. Reliable seller. No worries here! Delivered quickly. Packaging is good. This fiber laser continues to surprise me - it is a lot of fun if you are willing to take the time and are skilled in hardware/software. This after sell servicer has been very nice and given me great support. Highly recommend all around. I just figured out and installed the software everything working fine nice laser metal engraving machine in want to buy another one next year. But now, will contact Therese send the charge by Alibaba to buy a rotary. We engraved successfully on stainless steel with very good result. The software was on a small USB stick. The machine needs to be turned on before opening the software, or it will be in demo mode, the focusing is done manually and there is no distance indication, but overall you can see it is a quality machine for starting to engrave.Reply from STYLECNC: Thanks dear, we will continuously improve our laser marking machine.